Just imagine if they look this sick on the outside, how very sick they really are inside. This is inhumane, to say the least. And for what? What miracles for humans have come about from all of the torturing of these wonderful animals? An exhibit featuring poignant images and video of chimpanzees living in research laboratories juxtaposed with images of chimpanzees living in sanctuaries was recently on display at the Rayburn House Office Building in Washington, D.C. The exhibit was sponsored by the U.S. House of Representatives and created to educate members of Congress and others about the chimpanzees kept in laboratories and used in harmful experiments who would be affected by the passage of The Great Ape Protection Act (H.R. 1326). 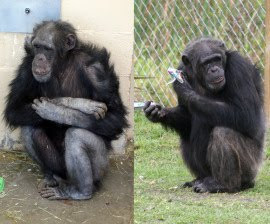 The Great Ape Protection Act would phase out the use of chimpanzees in invasive research and retire all government-owned chimpanzees to sanctuary. The act was introduced by Reps. Edolphus Towns (D-NY), Dave Reichert (R-WA), James Langevin (D-RI) and Roscoe Bartlett (R-MD).